Below is a written statement from one of our members regarding his last period in "Detention" - which is in-effect, prison. 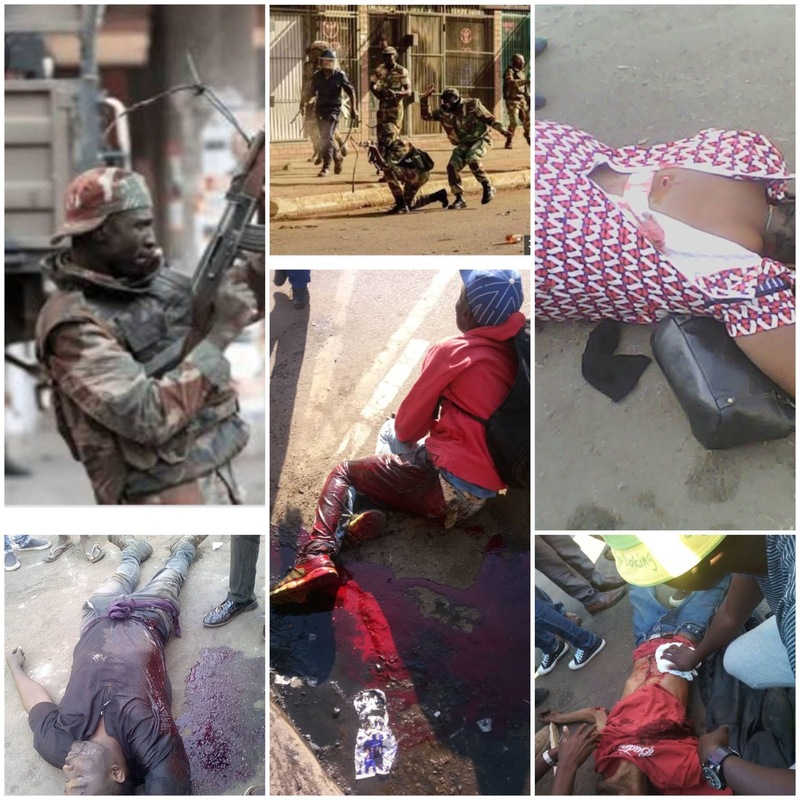 At present in Zimbabwe there is a "Commission of Inquiry" into the murder of 6 civilians by the Army. Zimbabwe is a very dangerous place if you are in opposition to the regime - this seems to count for nothing within the UK Asylum regime. It/they seems only too happy to terrorise asylum seekers here. Read on. My name is Bigboy Sibanda, D.O.B 28 January 1978, Home Office ref: S1142946 and I am a prominent activist, civil rights defender and an effective defender of Zimbabwe human rights in the UK. I am very vocal against "President Mnangagwa" and the Zimbabwean Government and its proxies, this places me at a heightened risk of being harmed, killed or persecuted in Zimbabwe. ""I had been detained for a week at Oakington Detention Centre in 2002, [and then] detained again from 1 July 2008 to 2 March 2011 (almost 3 years) at Brook House IRC". ""I was released on bail and electronically tagged for 3 years 9 months and 8 days. 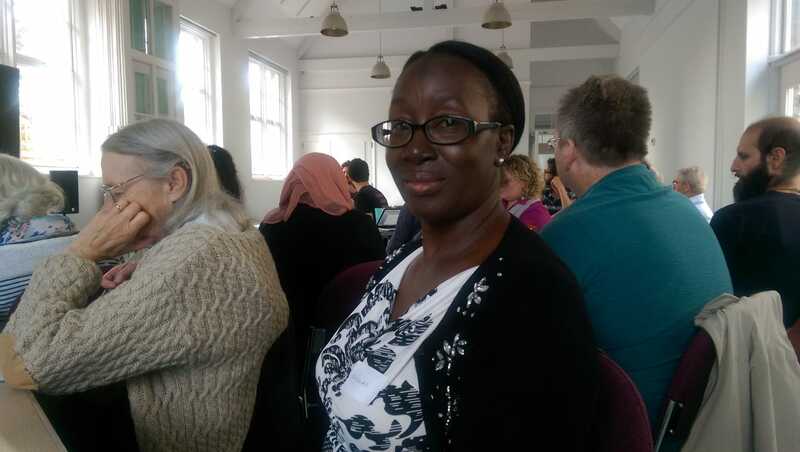 I reported twice a week on a Monday and a Friday for over 6 months, which got reduced to once a week, which became every Friday for over 7 years at Becket House London Bridge."" ""I was detained [yet] again on 15 of June 2018 at Brook House IRC and released on the 11 of July 2018 and continued reporting at Becket House every Friday without fail."" The Home Office wish to deport me to Zimbabwe. A country known to the world for its human rights abuses and corruption. I suffer from severe depression and anxiety which I am being treated for. For depression, I take Mirtazapine 45mg arodispersible tablets, which is the highest dose of antidepressants tablets. I also suffer from skin condition where I require Eumovate cream and my scalp itches to the point where my hair falls out and have to use Ketozopine Shampoo. All these conditions I picked them up whilst detained at Brook House IRC. I ask where will I get medical care in Zimbabwe, besides I am a torture survivor by the brutal Zimbabwean police. When I got detained [AGAIN, for the 4th Time] on the 19 October 2018, I pleaded with them to release me as I look after a 75 year old woman who has had a stroke, it fell into deaf ears, which shows how much they disregard human life and the fact that as a perceived journalist because of my writing of letters to the editor. I am facing real danger upon my return to Zimbabwe. There are articles online where I criticise President Emmerson Mnangagwa and the Zimbabwean government and its proxies. I am also very critical of the terrorist government of Zimbabwe on social media, Twitter and Facebook. ""When I was last detained, first at Brook House IRC, Gatwick Airport for 4 days, on the fourth night at 1 am, an officer came to my cell and told me to pack as I was being transferred. I refused and went to sleep as far as I was concerned I was a detainee in detention so what was the point of moving me to another detention centre. The following morning two massive officers turned up at my door and told me to pack my property or face being removed by force, so I packed and was transferred to Harmondsworth IRC, Heathrow Airport."" 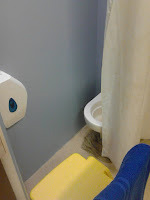 Harmondsworth IRC is a disgusting place, the Officers are horrible people, it is infested with mice, and bedbugs, there are a lot of empty cells for these reasons, as they are inhabitable. The place is a nightmare, very chaotic and scary. Detainees are bitten by bedbugs to the point of infection and as the medical care sporadic. The officers do not hesitate to use force, in fact, they seem to enjoy it. You are treated worse than animals and very often, "inmates" try to take their own lives. Food is inedible and disgusting. Whilst I was there a detainee went on hunger strike; officers didn’t even notice. Sometimes visits are left unmonitored which is why Harmondsworth IRC is rife with drug use. On the 26 October 2018, I was taken to Heathrow Airport for deportation. I was told by an officer to pack and go to reception I was being transferred. When I arrived in reception I was jumped on and surrounded by seven men (not officers). The Team Leader took control of that chaotic situation and said “just to let you know you're being deported today” I was body searched, told to shake my dreadlocks, told to open my upper lip and bottom lip, lift my tongue I was then chained without my consent, carried out like a bag of rubbish. I told them I was not given any notice or removal directions so they were smuggling me out of the country unlawfully. They answered they were just doing their job if I have any queries I should sort them out with the Home Office. I felt like I was arrested for smuggling drugs with the way the search went and like the worst criminal the way they chained me unnecessarily as I didn't resist. I did not resist the efforts to be deported as I was aware of an infamous case of Jimmy Mubenga from Angola who was killed in 2010 at Gatwick Airport by these racist Home Office escorts. On the way to Heathrow Airport I asked them about the removal directions, they showed me a pink paper with just “Emergency Travel Document” on it and I was not allowed to touch it and read it myself. I was also told I will be flying with Kenyan Airways on flight 101. My passport expired in 2008. and I have no I.D. I would like to know how the Home Office obtained my travelling documents? When I was detained in June 2018. I had an interview by Zimbabwean officials who said they were doing a survey on how many Zimbabweans are in detentions in the UK. They claimed they were sent by the Zimbabwean government to do a tally. They were heading for Moscow (Russia) next to do the same thing. They asked for my signature so they will get paid they said, which I refused to give as I feel they were not there for that reason, rather they were trying to make me one of the 2,500 Zimbabweans, the Home Office wished to deport, due to the "Windrush" debacle. I wrote about 10 important emails to broadcasting co-operations in the UK while in Harmondsworth IRC because I trusted that as persons working in a broadcasting and probably with an interest to journalists, they will intervene and assist if they're able, as I am facing possible charges of treason accompanied by a death sentence if deported to Zimbabwe, in its current climate as the army is still hunting down and killing opposition members and people who are vocal against the Zimbabwean government. If deported I am likely to be perceived as a journalist because of my writing on letters to the editor sections of various newspapers in internationally. It is the journalists who exposed "Windrush" scandal after all. I appealed for international solidarity and trusted they will do something to help. I begged them not to let me not suffer the same heartbreaking death that Jamal Khashoggi went through, in Zimbabwe. I am definitely facing real danger if deported because of my surplus activities in the UK particularly publicity about inciting the world to reject Zimbabwe's recent Election Outcome as it was rigged. This publicity is readily available on the internet and as a result of this, I will be questioned, identified and eventually exposed to real risk in Zimbabwe. 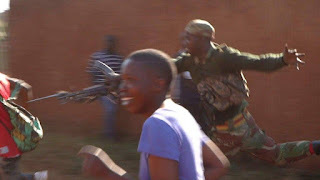 The Zimbabwean Militia are targeting human rights activists. I am heartbroken to tell you that my other MDC member in Zimbabwe died soon after elections because of his activism and many of them are being abducted and facing persecution, so my worry is, if I am deported to Zimbabwe, they will take me straight arrest me on arrival and charge me with treason, due to my MDC support. As you know the charge of treason carries the death penalty. which is still a method of choice in Zimbabwe! I am convinced beyond reasonable doubt that I am at a risk and real danger because of my incitement to the world to reject elections which were rigged. Zimbabwe government will definitely persecute me, harm me, detain me and kill me. Please stand up for me and do something to save my life. I beseech you to assist me and not stand by as I am in no doubt in danger. Please do not let it be, that you could have helped me and that the next thing you hear about me is that I was killed in Zimbabwe. 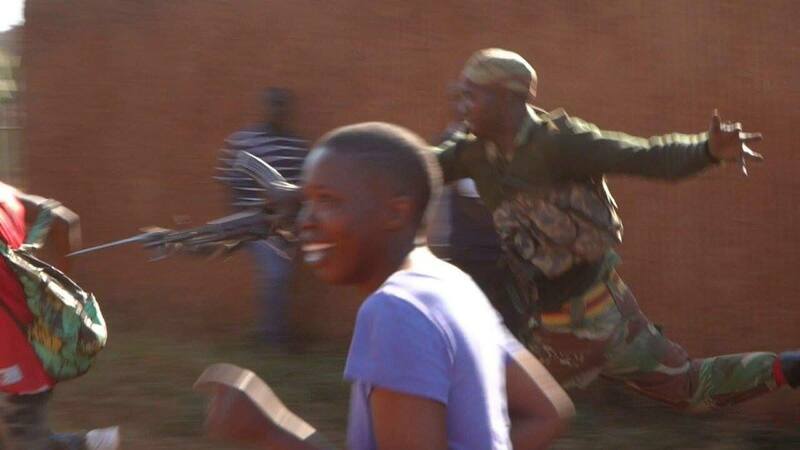 The Zimbabwean Militia are targeting human rights activists. I am heartbroken that other MDC members in Zimbabwe died soon after elections because of their activism and many of them are being abducted and facing persecution, torture and death so my worry is, I step my foot in Zimbabwe, I will be one of them. I will be questioned at the Harare Airport by the CIO and never to be seen again. ""The racist Home Office do lie and fabricate travel documents on your behalf without your consent and knowledge and use underhanded tactics of fast-tracking cases."" My fresh claim was refused before I submitted all the evidence I had in my computer as I was detained. Now I have just a matter of days to prepare for my appeal. They will say each case will be heard on its own merit, well not if you are not given a chance to fully prepare your case and be heard fully and squarely. My question is how come the racist Home Office is above the law. They seem to make up policies on a whim. Their country guidance is a farce it doesn’t reflect what's truly happening in Zimbabwe. Racist Home Office deporting Zimbabweans is like the Nazis sending Jews to the gas chamber. A report by Shiellah Mushunje, ZHRO Member - Peterborough. We had a fruitful meeting concerning the real plight of Asylum Seekers. It was well attended. Petition to be started on grant amnesty to all undocumented migrants so they can be self sufficient. Work with housing societies, to get supported housing for refugees. Here in Cambridge we have one central point, the main police station. Mobilisation of people with influence. 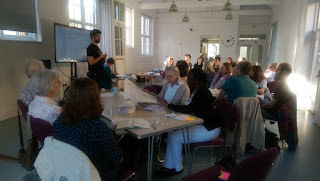 Academics, Feminist groups, Cambridge Refugees Council, Migrants Organise, Global Justice Now, Right to Remain, Anti Racist activists, Quakers movement, Cambridge care, Cambridge Ethnic Community Forum, Church leaders. Governmental or "State" terror: Sometimes referred to as "terror from above", where a government terrorises its own population to control or repress them. Let's apply these issue to the regime in Zimbabwe since 1980.
and other government agencies such as the Paracitals state institutions that are a source of looting for the elite. Changes to legal codes permit or encourage torture, killing, or property destruction in pursuit of government policy. In Zimbabwe's case the ruling regime has not signed up to the Convention Against Torture - nor the issue of Enforced Disappearance, thus allowing free reign to intimidate opposition. "Zimbabwe has not yet ratified three core international human rights treaties namely the Convention against Torture, and other Cruel, Inhuman or Degrading Treatment or Punishment (CAT), The International Convention on the Protection of the Rights of All Migrant Workers and Members of Their Families (CMW) and the International Convention for the Protection of all Persons from Enforced Disappearance (CED)"
Many of the Statutes in Zimbabwe are not aligned to the 2013 Constitution - making the application of "the Law" difficult to justify and certainly open to partisan interpretation. After assuming power, official Nazi policy was aimed at the deliberate destruction of "state enemies" and the resulting intimidation of the rest of the population. Stalin's "purges" of the 1930s are examples of using the machinery of the state to terrorise a population. Now contrast these actions with the Gukurahundi Genocide - a clear policy of the purge of 'opposition' "dissidents" in Mugabe's own words. Saddam Hussein used chemical weapons on his own Kurdish population without any particular change or expansion of policies regarding the use of force on his own citizens. They were simply used in an act of governmental terror believed to be expedient in accomplishing his goals. State involvement in terror: These are activities where government personnel carry out operations using terror tactics. These activities may be directed against other nations' interests**, its own population, or private groups or individuals viewed as dangerous to the state. In many cases, these activities are terrorism under official sanction, although such authorisation is rarely acknowledged openly. **The case in point is Mnangagwa's direct involvement along with the Zimbabwean Army in the Plunder of DR Congo. "Item 27: The key strategist for the Zimbabwean branch of the elite network is the Speaker of the Parliament and former National Security Minister, Emmerson Dambudzo Mnangagwa. Mr. Mnangagwa has won strong support from senior military and intelligence officers for an aggressive policy in the Democratic Republic of the Congo. His key ally is a Commander of ZDF and Executive Chairman of COSLEG, General Vitalis Musunga Gava Zvinavashe. The General and his family have been involved in diamond trading and supply contracts in the Democratic Republic of the Congo. A long-time ally of President Mugabe, Air Marshal Perence Shiri, has been involved in military procurement and organizing air support for the pro-Kinshasa armed groups fighting in the eastern Democratic Republic of the Congo. He is also part of the inner circle of ZDF diamond traders who have turned Harare into a significant illicit diamond-trading centre." Item 28: "Other prominent Zimbabwean members of the network include Brigadier General Sibusiso Busi Moyo, who is Director General of COSLEG. Brigadier Moyo advised both Tremalt and Oryx Natural Resources, which represented covert Zimbabwean military financial interests in negotiations with State mining companies of the Democratic Republic of the Congo. Air Commodore Mike Tichafa Karakadzai is Deputy Secretary of COSLEG, directing policy and procurement. He played a key role in arranging the Tremalt cobalt and copper deal. Colonel Simpson Sikhulile Nyathi is Director of defence policy for COSLEG. The Minister of Defence and former Security Minister, Sidney Sekeramayi, coordinates with the military leadership and is a shareholder in COSLEG. The Panel has a copy of a letter from Mr. Sekeramayi thanking the Chief Executive of Oryx Natural Resources, Thamer Bin Said Ahmed Al-Shanfari, for his material and moral support during the parliamentary elections of 2000. Such contributions violate Zimbabwean law." Historical examples include the Soviet and Iranian assassination campaigns against dissidents who had fled abroad, and Libyan and North Korean intelligence operatives downing airliners on international flights. Another type of these activities is "death squads" or "war veterans": unofficial actions taken by officials or functionaries of a regime (such as members of police or intelligence organisations) against their own population to repress or intimidate. While these officials will not claim such activities, and disguise their participation, it is often made clear that they are acting for the state. Keeping such activities "unofficial" permits the authorities deniability and avoids the necessity of changing legal and judicial processes to justify oppression. This is different than "pro-state" terror, which is conducted by groups or persons with no official standing and without official encouragement. While pro-state terror may result in positive outcomes for the authorities, their employment of criminal methods and lack of official standing can result in disavowal and punishment of the terrorists, depending on the morality of the regime in question. So what is the difficulty in ascribing the 'label' "Terrorist State" to Zimbabwe? They seem to tick all the boxes, have systematically intimidated, abducted, murdered, and raped their citizens. The Army has been used for political purposes and for the personal gain of their elite ranks. The elite political group have benefited financially in their $billions - so how can Zimbabwe be considered a democracy? BZA Statement: "...the process [observing printing ballot papers] was null and void"
ZEC [Zimbabwe Electoral Commission] are presiding over a ballot printing process that has NOT been legitamately observed by the opposition parties taking part in the 30 July Elections. This also included EU Observers! What was observed however, was obfuscation and opaqueness in the extreme. Questions about the process went unanswered and the observers were not permitted to see the process in the same room, they were not allowed to observe a sample. What 'fraud' is being perpetrated in this ballot paper printing process that the ZEC Official was so intent to conceal? 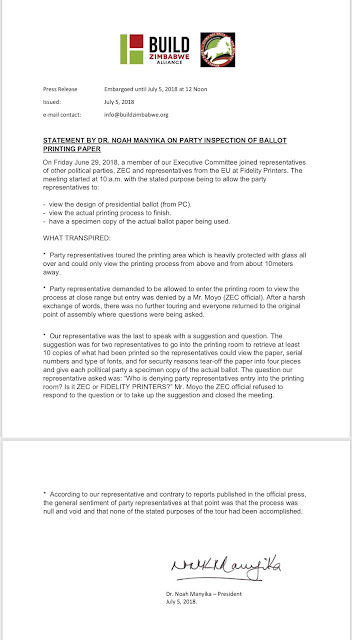 "According to our representative and contrary to reports published in the official press, the general sentiment of party representatives at that point was that the process was null and void and that none of the stated purposed of the tour had been accomplished"
So where can Zimbabwe go from here? This flagrant breach in the duty of the ZEC cannot be left unanswered. Despite promise after promise, and despite the "thumbs up" from the UK Ambassador to Zimbabwe [funny - who is being transferred to Nigeria in November! 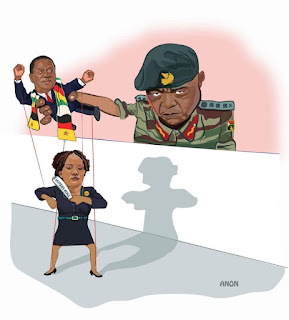 ], Zimbawe's 'highly suspect' Electoral Process is full of gaping 'holes' - even though the apologists keep claiming that it will be Free, Fair and Credible! ""We asked respondents if they are satisfied about the preparations being made to ensure that the elections are free and fair. The majority 72.49% are not convinced that the elections will be free and fair. Through a question that allowed for multiple response, we asked them why they think that the elections will not be free and fair. They cited many reasons as per figure below."" 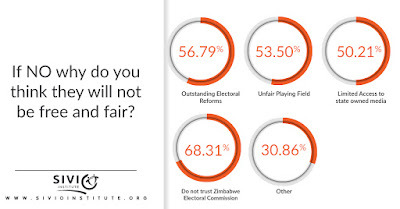 Fig 5: Answers to "why these elections will not be Free and Fair"
The majority 68.3% do not trust the Zimbabwe Electoral Commission, the agency responsible for running elections and there are some (56.79%) who feel there was need to carry out all outstanding electoral reforms before holding elections. 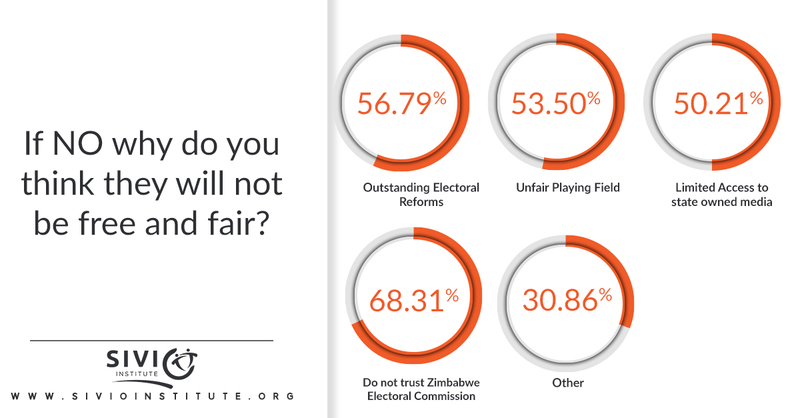 SO let's recap: 72.46% of the respondents are not convinced that the Elections will be Free and Fair. AND 68.3% do not trust the ZEC - the body organising the Election Process. Addressing journalists in Harare, ZEC chairperson, Priscilla Chigumba, said political parties had "no choice, but to participate in the July 30 polls and raise their complaints later as the election date cannot be changed." Tawanda Chimhini said: “For lack of a better word, it is very tragic. If ZEC is preparing for an election, it should prepare for a free and fair election, not one that will be challenged. “Refusing to share details on the voters’ roll, refusing inspection of the voters’ roll so that people can give feedback is an admission that ZEC does not want any form of oversight and accountability. It shows the election commission is not ready and serious about running national elections. 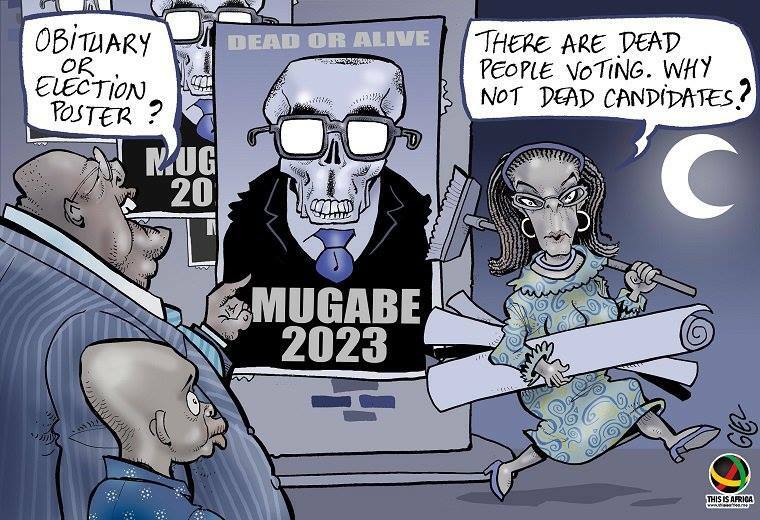 Chimhini added: “How can they prepare to go for an election that will be contested? What is the rush? What type of an election are they preparing to run? “We went to court and obtained a court order for them to release the voters’ roll used for inspection, but ZEC has defied a court order because it wants to run an election without accountability. Well there you have it - an election that is acknowledged to be highly suspect and with many flaws - by the population, the opposition and the Zimbabwe Electoral Commission itself! Furthermore, the skewed Ward system which gives undue electoral advantage to the sparsely populated rural areas - the peoples of whom, are in turn the 'victims' of the ruling party's intimidation tactics - to induce voting for the ruling party. This intimidation is carried out by so called 'Zanu PF "Youths"' [ages up to 55!] and the Army - which the ruling party seems to bestow far too much due deference to - in fact some say that the Military are in fact in control. This highly irreverent cartoon shows the [retired] Army General - (now Zimbabwe's Vice President), working Mnangagwa (Now President, after a de facto coup d'état in November 2017 and Mugabe's right hand hench man for 37 years) who in turn is pulling the strings of the ZEC [Zimbabwe Electoral Commission] Chairwoman - about whom we have been discussing above. The likenesses are surprisingly very accurate! At the end of the day the Elections in Zimbabwe will be a sham, but who will do anything about it? As in 2008 there was a de faco coup d'état, and in 2013, the Elections could not be classified as Free and Fair. So in effect we have AN ILLEGAL [MILITARY] DICTATORSHIP, with a so called "ruling party" not democratically elected, calling the shots to re-elect itself. Well that will be free, Fair and Credible then - won't it? TRAGIC - is the word, as stated above. How can Zimbabwe, so Rich in Mineral Resources, be so Impoverished? ""Zimbabwe’s economy is characterized by instability and volatility, both of which are hallmarks of excessive government interference and mismanagement. Massive corruption and disastrous economic policies have plunged the country into poverty. An inefficient judicial system and general lack of transparency severely exacerbate business costs and entrepreneurial risk. The government will likely adopt desperate short-term measures to stave off economic collapse, possibly including a unilateral de-dollarization that would reopen the door to hyperinflation, further crippling the private sector and severely undermining macroeconomic stability."" ""Zimbabwe’s economic freedom score is 44.0, making its economy the 174th freest in the 2018 Index. Its overall score has not changed, with significant improvements in scores for the trade freedom and judicial effectiveness indicators exactly offset by a plunge in fiscal health. Zimbabwe is ranked 44th among 47 countries in the Sub-Saharan Africa region, and its overall score is below the regional and world averages."" The graph above needs further explanation. In 2008 the Military [a de-facto Coup d'etat] over-turned a 75% election win by the MDC opposition and created a "Government of National Unity" [sic] . In practice this had Tendai Biti from MDC as Minister of Finance - who very rapidly turned the fiscal situation around - by basically curtailing suicidal Government Spending. However, too often the "Office of the President" [Mugabe] would limit or over-rule his sensible actions. Therefore the growth from 2008-2011 is initiated by MDC's Mr Biti - but by 2012 the old "habits" of profligate patronage and corruption are starting to take effect. 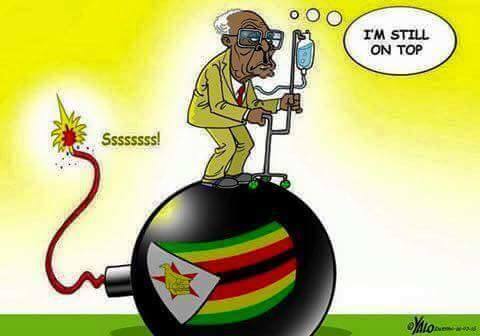 The vote rigging in 2013 made sure the Zanu PF once again took full control. The Graph clearly indicates the folly and general incompetence of their economic policies. Additionally intimidation, political violence, Human Rights Abuses, Torture and corruption took hold once again - and to this day are continuing, with only the briefest respite when Mugabe was removed by a de-facto Coup d'etat in November 2017. In an attempt to win the 2018 election, Zanu PF and their new imposed "President" Mnangagwa is spending a reported $200m on his campaign with massive posters all over the capital. Also a propaganda "Charm-Offensive" and the slogan "Open for Business" are being widely marketed both domestically and internationally. Unfortunately there is little evidence of an independent media in Zimbabwe. The only TV Channel is run for the benefit of the regime, and only reports on negaitive aspects of any of the opposition, The same is true of several of the newspapers - particulalry the overtly partisan Herald. Free and Fair Elections have been promised, but delivery of this promise is very hard to find. The media is still partisan, the Zimbabwe Electoral Comission is still partisan, The Military is still partisan, the Judisiary is still partisan - in fact nearly every organ of Government and Nationalised Industry is partisan. Additionally the 2013 Consitution is being breached by partisan legislation designed to maintain an unfair advantage for the regime. With Elections scheduled just a few months away Free, Fair and Credible voting is not possible. Indifference to the people's desperate needs, indifference to the people's pain and suffering is what will pen the political demise of the willfully clueless unelected Zanu pf coup leadership at the helm of the republic. I am not sure if his utterances and ill conceived decisions are symptomatic of an adverse reaction out of abuse of ambi and ponds which maybe have gone past the skin to his brains, It is imperative that General Chiwenga and his installed project Mnangagwa be guided accordingly so that they are fully aware of what the true owners of the republic, the general populace are capable of doing with their vote because being continually mocked by these two that Zanu pf will rule forever because they are entitled to doing so by virtue of their liberation credentials is not only sickening but insulting in view of the naseous mess we are currently festering in, a product of nearly four decades of gross mismanagement of the economy, corruption, entitlement and unchecked looting by the said and their fellow Zanu pf comrades. For the record General Chiwenga seems to be ill informed, he is not aware that we cannot continue to salute politicians who are doing nothing for the general populace nor anything to develop the republic save for looting national resources. So that liberation war talk is stale, it is way outdated beyond its shelve life, it holds no clout, it is irrelevant because it does not put food on ordinary people's table and the so called liberation gains he constantly refers to have not translated to the nation so we have absolutely no reason to celebrate ill gotten personal gains since it has nothing to do with the national development but personal gains for a select few. May our Coup installed General Chiwenga be reminded that the people of this republic do not owe him or his assistant Mnangagwa any apologies and also be reminded that he is in for a rude awakening if he continues thinking that Zanu pf is going to be ruling forever because they are not, as a matter of fact this year will be their last call as a ruling party and will soon be the opposition. My brothers and sisters, do not be intimidated by anyone claiming special privileges or access to national resources without being accountable to any checks and balances while evoking immunity for their ill calculated actions or any misdeeds primarily because they have a claim to being a freedom fighter or revolutionery. This has been abused so much that, it doesn't scare us anymore, it is of no relevance to the challenges, needs and dictates of this generation. My take is having lived under the harsh realities of a Zanu pf led government's failed economic policies and brutality, they foisted upon a people is no different than fighting a war and surviving in a war zone where daily you fight for survival, scraping for a living, trying hard, fighting to defend your own freedoms and liberties from a repressive regime hence being revolutioneries and freedom fighters by virtue of that war we are still waging, a nearly four decades long war of survival. The grim reality of living under a Zanu pf regime has not only been atrocious but depressingly heart wrenching and traumatic, that is why it is imperative for Zanu pf to leave our political diet to allow a people to heal as soon as they are served their electoral packing orders. Not only will it be therapeutic but a very well deserved rehabilitation and national healing from the wounds of the brutal repression and a sustained denial of workers and a people's rights. Should there be any benefits to be qualified for, I am glad to say that the whole country will qualify for it because we are all revolutioneries and freedom fighters waging a war against a system of dictatorship taking away workers rights, stealing national resources, intimidating workers and citizens from expressing their need for a better standard of living. Having suffered for nearly four decades and still fighting a social political revolution, for a better standard of living and opportunities being hoarded by a rogue regime for selective access to a few kin of the corrupt politicians, we the general populace are the true freedom fighters and revolutioneries fighting a corrupt and repressive system, a military dictatorship. Always remember my brothers and sisters that you are a revolutionery and freedom fighter by your own merit, in your own right because fighting a repressive system, poverty daily, nursing a wounded will to carry on under draconian laws, enduring inhibitive government sponsored terror, anguish and inhospitable conditions, living under a repressive Zanu pf regime intolerant to dissent, calls for resilience, it requires a special set of survival skills and the will to continue to survive without any hope in sight. That fighter instinct in you, that revolutionery in you, that freedom fighter you are, has carried you in torrid conditions to today, so let no one have such an antiquated claim like Chiwenga's utterance that he will forgive us for not having fought the liberation struggle, its nothing to be proud of, when all there is, is falling in to the hands of tyranny and dictatorship. We owe no one nothing but have been robbed and stripped of our dignity as a people for the last three decades and eight years in counting by the same thieves now wanting us to salute them without question, no, we wont because we the people are the true freedom fighters and revolutioneries fighting for the change we deserve from a system holding us hostage under the beluef that we owe them a lifetime of debt for their liberation participation. It is now time to cut off the umbilical of entitlement and unfettered access to national resources by a few political thieves and their military cohorts.